MELKSHAM, UK, 04 October, 2018 – Avon Tyres will reveal a brand new tyre at the 2018 American International Motorcycle Expo (AIMExpo) next week. Running from 11 October to 14 October, 2018 at the Mandalay Bay Convention Center in Las Vegas, the Expo will see the U.S. launch of the brand’s new Cobra Chrome cruising tourer tyre range, now with improved longevity and more fitment options than ever. It is a replacement for the popular Cobra range which has a well-established reputation in the custom and cruiser segments. The new Cobra Chrome offers an advanced construction design to deliver improved stability and durability in all conditions for precise feel and tyre feedback. 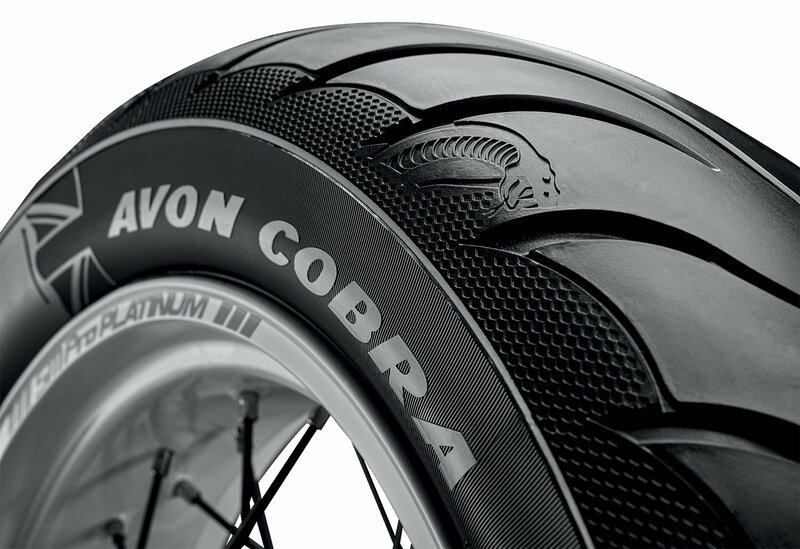 With rears up to 23 inches in diameter and widths of up 330mm, the range comes in a wide variety of specifications and sizes to cover cruisers, tourers and custom bikes, and each tyre features a stylish Cobra-themed design with a snakeskin appearance and embossed Cobra head logo on the tread edge for enhanced aesthetics. Also on display will be the Avon Spirit ST hypersport touring and TrailRider adventure sport ranges. Visitors to the Avon stand – Booth #1415 – will also be able to see a Triumph Bonneville Bobber Black, fitted with Avon tyres as original equipment. The AIMExpo brings together industry, press, dealers and consumers in a single arena that creates a grand stage for motorcycling and powersports in the U.S. and North America and features almost 500 exhibitors.